It all started in 1976 as the dream that came true,* when the CHEMRAWNCHEMical Research Applied to World NeedsCommittee was established following suggestions and plans for how IUPAC might help solve world problems through chemistry. A quarter century later, CHEMRAWN, and the series of conferences that bears the same acronym, is one of the most renowned activities of IUPAC. The committee develops periodic conferences around the world to explore issues relevant to meeting human needs where chemical research and the products of chemical research can help to meet those needs. In doing so, the committee involves other organizations, public- and private-sector scientists, politicians, regulators, environmentalists, and other opinion leaders in developing and carrying out conferences. For each conference, a Future Actions Committee develops perspectives and actionable recommendations. The committee then tries to ensure that the recommendations are implemented. 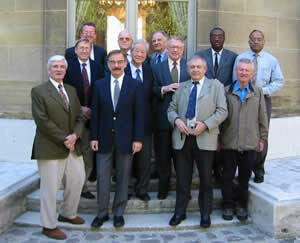 The most recent CHEMRAWN Committee meeting was held in Paris in September 2002. CI asked its chair to review the committee plans and current activities. * History of IUPAC 1919-1987, by R. Fennell (IUPAC, 1994), p. 263. The CHEMRAWN series of conferences has been an essential way for IUPAC to address issues that transcend pure science and have important socio-political aspects. Over the past quarter century, 12 CHEMRAWN conferences have been held that brought together experts in science and technology, including industrial leaders, government policymakers, academic scientists, and members of the general public. Together they have explored, discussed, and debated how chemistry, chemical research, and chemical resources can help meet a major human need or solve a major problem. Each conference has a Future Actions Committee that develops a set of perspectives and recommendations that can be widely distributed and in some cases catalyze follow-up actions. Following CHEMRAWN XIV, a training session in green chemistry was held in Thailand and several new green chemistry networks were established around the world. Following CHEMRAWN VII, a cooperative atmospheric monitoring effortinvolving government, academia, and industry was launched in the Peruvian Amazon Basin to gain a better understanding of carbon dioxide fluxes to and from the forest canopy. Several of these will be smaller, less expensive workshops, possibly "virtual conferences" or "thinktank" studies, given the difficulty in funding large conferences, such as some past events that cost as much as USD 400 000. The CHEMRAWN Committee at its meeting in Paris in September 2002. Front row: Prof. Patrick Moyna, Dr. John Malin, Prof. Fedor Kuznetsov, Prof. Erwin Buncel. Second row: Dr. Parry Norling, Dr. Min Che Chon, Prof. Raymond Hamelin. Back row: Dr. Alan Smith, Dr. Pierre Potier (President of the Maison de la Chimie, Paris), Dr. Jerzy Kopytowski, Prof. Ikenna Onyido, and Dr. Swaminathan Sivaram. If the committee is successful in carrying out this plan, the CHEMRAWN conferences will continue to be a valuable activity of IUPAC. Anyone who would like to participate is invited to contact the committee chair Dr. Parry Norling. Parry M. Norling <norling@rand.org> or <Parry.m.norling @usa.dupont.com> has been chair of the CHEMRAWN Committee since 1998 and a member since 1993. He is currently an AAAS Fellow at RANDs Science & Technology Policy Institute, in Arlington, Virginia, USA, and a Corporate Technology Adviser at DuPont. Page last modified 13 March 2003.